Inside the community of comedy we grieve the tragic death of Robin Williams. Devastated by his genius, we’re in ruins by his end. We lost the gentlest, most electrifying comedy soul we’ve known in our lifetime. So, today . . . for at least a day . . . .the laughter stops. It has to. But don’t worry. As one of the marginal purveyors of the art form, I can assure you the jokes will probably get to you again tomorrow. They might come your way in a limp, but please understand that we really don’t have a choice. The first time I met Robin was in and around 1977 at the Laff Stop in Newport Beach. I was emceeing a show that week; a show that featured David Letterman as the opening act, Fred Smoot as the middle and Jay Leno as the headliner. That’s what it was like back then. Comics in search of their place, not yet knowing but having an inkling. Well, Smoot got sick mid-week and couldn’t finish it out. So they replaced him with a comic who had just moved from San Francisco to Los Angeles. It was Robin. Imagine what half-a-dozen people witnessed for the price of two iced teas. Letterman, Leno, and Williams crafting from thirst; nothing more than a nightclub’s elevated excuse to sell drinks. On that particular night just after Leno finished his act, I went back up to conclude the show when Robin started heckling me. He grabbed the fire extinguisher, and started dancing with it and me on stage. He got so deep inside his improvisation he unleashed a stream of carbon dioxide aimed squarely at my face. Fortunately, I turned to the side and avoided any real damage. The following day Robin drove to Newport Beach early to make sure I was okay. He apologized and said he was so lost inside his character he had no idea what he’d done. I didn’t see him again for months. When I did, he told me about being chosen to do a remake of Laff In with his friend and Julliard roommate Ben Powers, another tragic figure. Of course, from there he rocketed, and I didn’t see him again until he performed at the Ice House about a year or so later. He was Mork by then and the biggest comedy star in America. We talked briefly in the green room but he’d changed. He was surrounded by people from his management company, heavy into cocaine and the aura I noticed in him before the fame seemed exhausted. We hugged, I thanked him for helping the Ice House (he performed for about an hour . . . .brilliantly, of course), and that was pretty much the last time we spoke. He was flawed, no doubt. Comics knew him to absorb the material of others at times. I saw it myself. But I knew it more inside the free flow of his explosive creativity than as an intended, intentional act. That’s not important now. 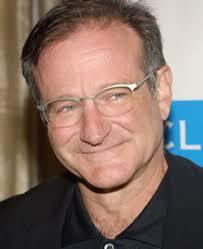 What is important is that we witnessed the possibilities of what the mind could do in Robin Williams. We witnessed a man committed to creating laughter in a manner no one had ever seen before and may never see again. How blessed I was to be given a backstage pass into his gentle, breathtaking genius. Ironically, I wrote about a similarly tragic comic in my debut novel, Cape Comedy . You see, besides Robin, I knew Ray Combs, Steve Lubetkin and Richard Jeni; comics who also chose themselves to end themselves. Sadly, it’s embedded in the culture. So, cherish your comics, America, and understand that although they might be blessed for having the gift, they’re also cursed for having to fuel it. Former Comedian Marc Weingarten, who grew up in South Florida, recently released the novel, Cape Comedy. He resides in Pembroke Pines. NEVER KNEW YOU WERE SO TALENTED…..